With the constant support of our expert team, we are engaged in offering a huge assortment of Single Gas Range. Our range of commercial single burner gas stove is available with high quality brass burners. 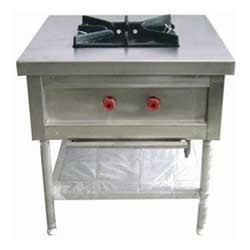 The fine finish and fuel efficient feature add to the safety and easy operation of the burner. These single burner gas stove is offered with inbuilt features of being washable, easy to clean and without any sharp edges at the bottom. Looking for Single Burner Gas Range ?